“The practice is different, now, from Thailand. Its not lush rainforests, dripping outside, and dimly lit pavilions and hours of silence, stretch and sea. Thailand was a place of deep introspection, becoming present with self and heart, and in that delicious seclusion of self-absorption, discovering the bliss of the present. Now the practice is one of domesticity. My retreat, now, a moulting mat, squished beside the futon and printer in the spare room. I practice. Dynamic, yin, sitting, shavasana. A snuffle at the door, the black nose of my puppy. A cry and scratch. Now my practice on the mat, is interrupted and intruded upon, but the devouring practice of domesticity. Thank Grace for that. Perhaps my hips will never rotate and abduct in quite the same way again, but in a moment a puppy has climbed upon me, covered me with exuberant wet kisses, and I am present and complete in the moment. Her hunger wins over, and now my fingers smell like dog meat, she’s just peed on the floor, and I stay present, stay present. On the mat, my practice is a true flow, one pose at a time, never knowing what will come next. A forward bend, a back bend, or a puppy urinating on the floor. My practice eases and gives way, spreading itself generously into the mundane and routine. I feel the pegs my fingers as I hang out the laundry, watching the wind shift through the mango tree. I am aware of the subtle warmth of satisfaction brewing in my belly, as I wipe, and clean and make my home. As I lay my head on husband’s chest, and the puppy bounds in, never one to be left out, and a lazy moment of affection morphs into an overflowing eruption of new family love. I am so grateful, for what was learnt, was is always learnt, on the mat. To catch the mind designing the next posture, and missing the one it is in. To spot the mind as it reaches for past, plans away the future. How it makes restless excuses to get up off the mat, to shift the body, to move away from the present. I watch that practice grow fingers, and walk, and reach, and move into my whole my life. Perhaps tomorrow, I never make it to the mat. But my puppy will teach me, when she chews through my power cord, and I catch the fear and rage before it explodes. Or I don’t, but I notice it as it happens. My husband will teach me, my work will teach me, as I swim my laps, or walk to work, and sink my awareness into my feet, and into the breath passing through me. grace: not that love, and satisfaction can be found on a beach in Thailand, but that it can be found here, in the moment, in a life filled with work, chores, rental-agreements, breaking down cars, marriage and an un-toilet-trained puppy. This is grace. To be present in all of this, and still find that inexplicable fullness”. This is the experience I am experiencing at the moment. If any of these ideas resonate with you my invitation is to come and explore this further with us here on Still Flowing Yoga Teacher Training in Thailand and Ibiza. same end. These are all forms of escapism. imperative to learn how to be and to enjoy being, fully embodied. Having just completed another teacher training in Ibiza, suffice to say that we are fully grateful to have been able to transmit the ancient teachings effectively to a small and intimate group of committed students. It is for sure a very wonderful way to work, the dharma has its own agenda and it is allowed to do its work , a space of love, acceptance and understanding is held in every teacher training allowing each student to experience the teachings directly and in a way that resonates individually with them. Lie down of the floor, feel the ground beneath you, feel how the earth supports you, breathe, relax, release and let it all go, all the ideas you had of what it is, it isnt, how can it be, never mind, you always have the ground to return to, to hold you, to support you.. When practice is greedy and impatient there is no way that you can receive the teaching, there must be a shift in practice to one of slowing right down, stopping, and emptying out the full cup of undigested material, seeing that it is of no use and just say ok let’s try again, let’s be brave enough to let go of all that and start afresh. As practice is practice and everything that we are learning here, all the techniques are ways to touch the moment, to touch our human experience deeply, to embody awareness fully, there is no need to have a head full of spiritual ideas and have followed 100 different practices and courses, all this does is create a big thick confusing blanket of ideas and concepts about spiritual stuff that actually serves as a barrier that separates us even more from the moment, when the mind is free of ideas about spirituality if feels like you are swimming in the sea naked as you contact direct experience, when the mind if full of ideas about what spirituality it’s like sitting in the boat, looking at the sea, wearing a full body wetsuit, snorkel , and air tanks and questioning whether it’s worth going for a dive or not..
Yoga For Unity is working on an awareness campaign for a charity group called The Africa Yoga Project to support Kenyan yoga teachers who, using yoga are tackling Tribalism in their country. Already this has seen many youths, who were idle and living in the slums, to receive a personal transformation through the practice of yoga. It is this experience that the yoga teachers would like to take out to the the rural districts in Kenya Rift Valley, to bring transformation on community levels. Yoga For Unity is having it’s big launch for this awareness campaign on Saturday 18th December and will be hosting “Flash Mob” style events in London, in LA and in Kenya. These events will be Yoga Sessions, where volunteers on the day in guise as normal members of the public will drop to the floor, roll out yoga mats and will complete the Sun Salutation series for 5 – 10 minutes. The London event will be on Saturday, December 18 at 1pm in Covent Garden (more exact location to come) and will last about 5-10 minutes, max. We are pushing publicity for this event far and wide and we’re promising a short, edited video of the three events combined. We will load this up on Youtube once the event is over to carry on the support over Christmas! At Still Flowing Yoga Teacher Training, we have offered to raise funds for both Yoga for Unity and for Africa Yoga Project. We will donate 10% of any booking made that mentions either project towards these combined projects from 18th December 2010 – 5th April 2011. This means by booking with Still Flowing Yoga Teacher Training you are making a direct contribution towards this amazing, effective and highly transformational work of Yoga at a grass roots level in Kenya. Quite simply through stretching and breathing, Kenyans are learning to find peace in themselves and also with their neighbours. Still Flowing Yoga and its teaching and form is organic and flowing, no dogma, no belief system necessary. Just an openess and willingness to return to the beginners mind, the original mind, the primal mind. No need for more accumulation of learned knowledge, just step into your true nature. Asana (postures) and pranayama (breath and energy work) open, ground, and enliven the body, mind, and heart – thereby both supporting and expressing the more subtle meditative limbs of yogic practice. The yoga poses are also used as a powerful vehicle for training in – and embodying – core dharma principles, such as compassion, joy and lovingkindness.As we flow between movement and stillness, this unified practice gently unwinds the contractions that can block embodied presence, while cultivating access to the spacious and kind awareness that is our true nature. Through the training we will be cultivation mindfulness, the capacity to meet life moment to moment with open-hearted presence and gain insight into the endless flow and flux of phenomena that makes up our human experience, this we will see can be expressed and explored on the mat as we flow through Vinyasa. Still Flowing Yoga TT offers a solid, non-dogmatic understanding of the entwined history, philosophy, and techniques of both yoga and Buddhism and aims to find the essential oneness of Patanjalis eight limbs of classical yoga and the Buddhas teaching. The form and structure of the course is organic, meaning it has flexibility and will change and adapt according to the needs of the group as all our teachers work in an intuitive way. All the material we propose is still covered on every course however its interpretation might differ on each course and it might not follow a set format and is taught in a non-linear fashion. This way of presentation is in tune and aligns with the philosophy of Vinyasa Flow Yoga that is characterised by its organic nature, its return to intuition, its free form, and its spontaneity, however Vinyasa Flow is a classical form of yoga. We encourage students to question continuoulsly whilst still maintaining open and receptive minds, to listen deeply, and enquire all within the safety of their own personal experience. 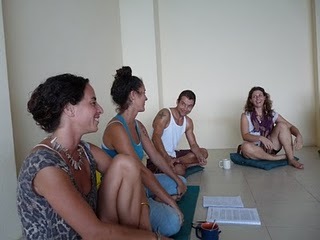 The teaching aims to provide clear, graspable, simple foundations and principles to guide us through technique, yet we encourage the teaching and practice to be a gentle unfolding, a personal journey, where the individual is honored, where we return to a natural state of intuition, to a place of freedom.